Next Friday 19th and Sunday 21st of April, the Science and Visitor’s Center will remain closed. Happy Easter! 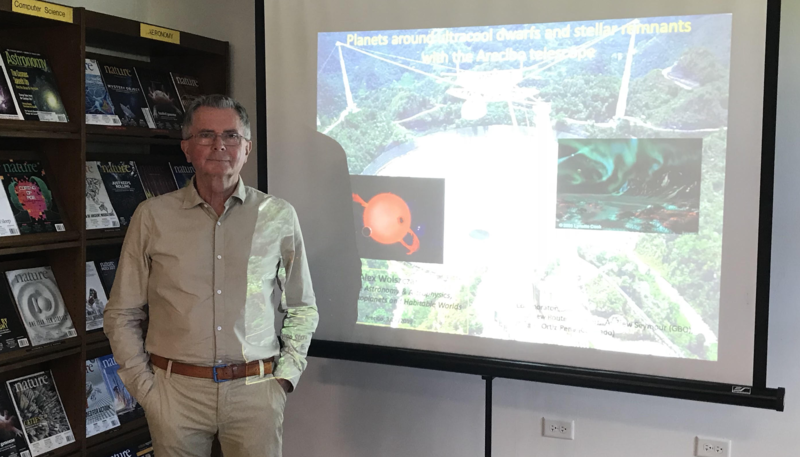 Dr. Alex Wolszczan, who is a professor at Penn State and a long-term user, visited the Arecibo Observatory during the week of March 4th, 2019 as part of an observing campaign to search for radio emission from cool brown dwarfs. Education REU 2018: Student Brandon Smith presented his work. Past REU student, Brandon Smith, attended AGU Chapman Conference (11 - 15 February, 2019) held in Pasadena, CA, USA. He was presenting his research work performed at the Arecibo Observatory this last summer 2018. He is current an undergraduate student (Meteorology) 000from at Penn State University.